Using the innovative Whole Life/Health Cycle safety training approach, this Back Safety course explores habits that can keep employees safe, healthy and productive. 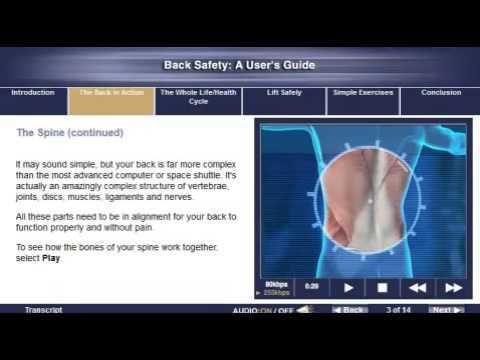 BACK SAFETY ONLINE ASSESSMENT: Testing conducted in this online Back Safety course is designed to reinforce the information presented. A mark of 80% must be achieved in order to receive a certificate of completion. Participants are able to repeat the course twice if the pass mark is not achieved on the first attempt. BACK SAFETY ONLINE CERTIFICATE OF COMPLETION: Upon successful completion of this online course, a certificate of completion will be available for download and printing.